With all of the cities that we visit, we will obviously need lodging. Most of these are nice chain locations that we try to mention during our overview articles. Once in a while we will happen upon a location that stands out as a special stay. This was the case in St. Louis, when we stayed at the Moonrise Hotel on the Delmar Loop. Touted as a modern boutique, it has some of the most unusual decor of any lodging we have encountered. We want to thank the Moonrise Hotel and Explore St. Louis for their hospitality. Rest assured that all opinions are our own. The Moonrise Hotel is the brainchild of Joe Edwards, who is somewhat of a St. Louis hero. Dubbed the “Duke of Delmar”, he led assorted efforts to revitalize this decaying section of the city. After decades of work, the Loop is now a vibrant section filled with entertainment, dining, and shopping options. It has even been recognized as one of the “10 Best Streets in America”. Amid all of this development, he realized the need for a hotel that would serve the visitors to this new destination hot spot. 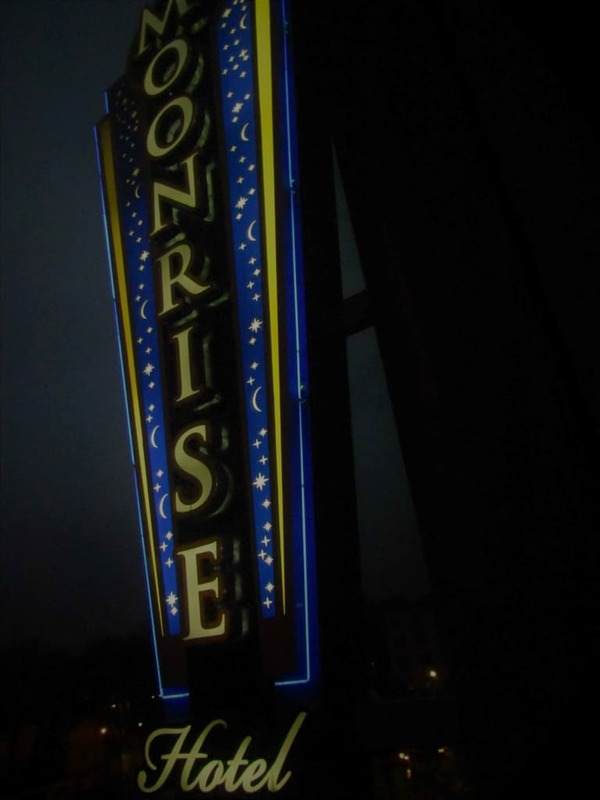 Opened in 2009, the Moonrise Hotel quickly became the choice lodging of those wanting to be near the action while visiting St. Louis. Joe Edwards has an affinity for all things space related. It becomes quite apparent as you stroll through the hotel lobby and further into the interior hallways. 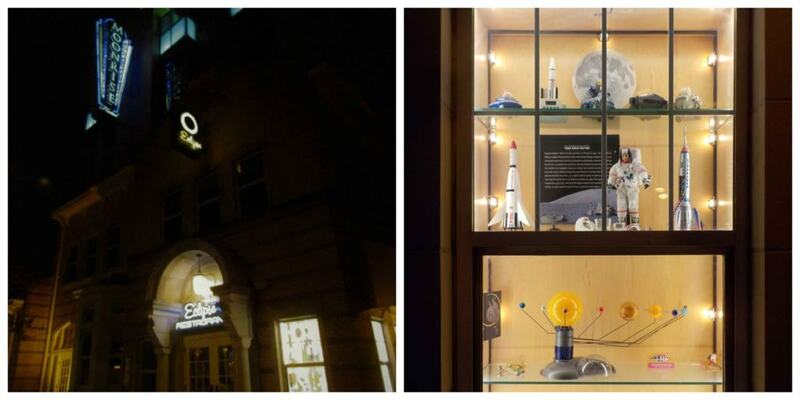 Even on the outside we found display cases filled with toys, scientific displays, jewelry, and various space memorabilia. This same theme resounds in some of the other businesses he is associated with along the Loop. It certainly makes great eye candy, and we enjoyed examining the cases to see which pieces we could recognize. Entering the lobby, we were greeted by the bright, vivid colors that are found throughout the building. It certainly made the place cheery. 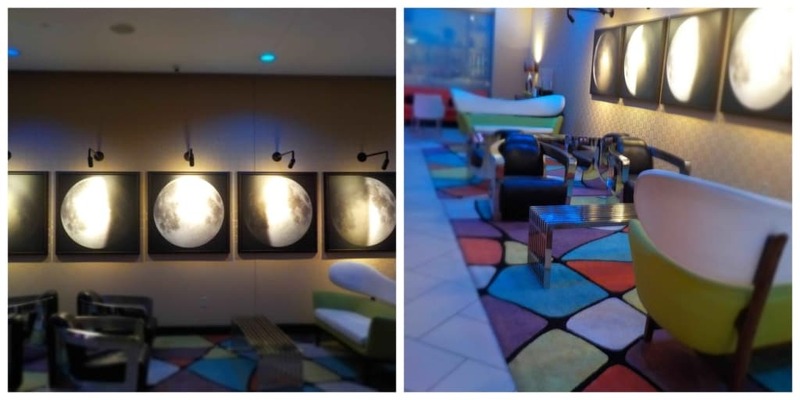 Over the top decor is certainly a mainstay at the Moonrise Hotel, but it is done in a way that ties it all together. Chief among these unique decorations is the lobby staircase. 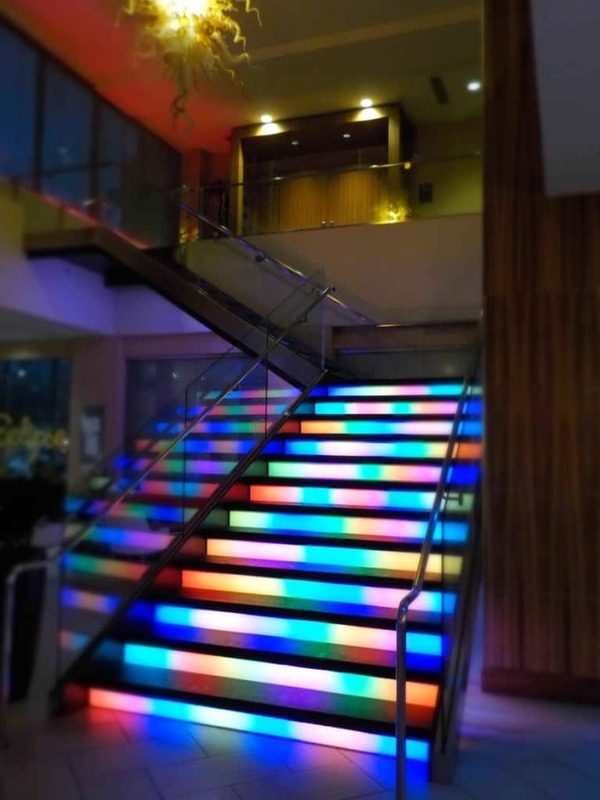 The colorful lights play across the stair risers inviting guests to explore. The staircase leads to the second floor meeting rooms, which include some fun sitting areas overlooking the lobby. Be sure to explore this vantage point during your stay. After checking in, we made our way to the guest elevators for this quirky eight-story hotel. Along the wall we found more of the space display cases to peruse. Inside one of these were some rare autographed pieces with names of astronauts we have heard of from the past. 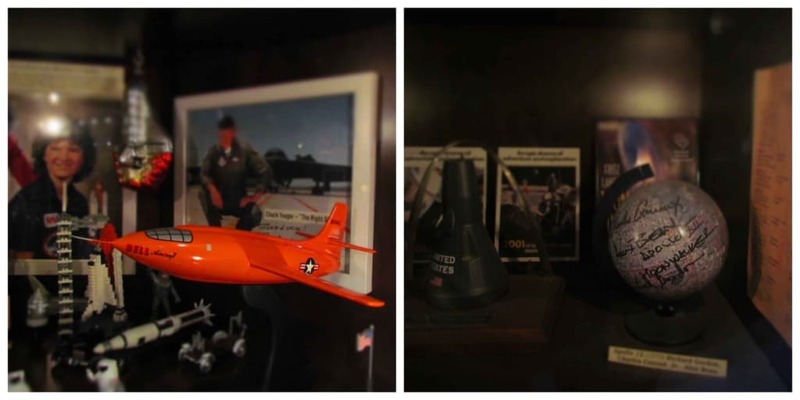 The Moonrise Hotel almost pulls double duty as a miniature museum with all of the artifacts. We can almost bet these types of displays are on every floor, but time didn’t allow us the luxury of checking. If you do explore in more detail, please let us know what you find. We finally made it to our room, and immediately fell in love. On occasion we have had the opportunity to stay in boutique hotels, and always leave satisfied. The recurring theme to them is elegant comfort. This applied to the Moonrise Hotel, as well. 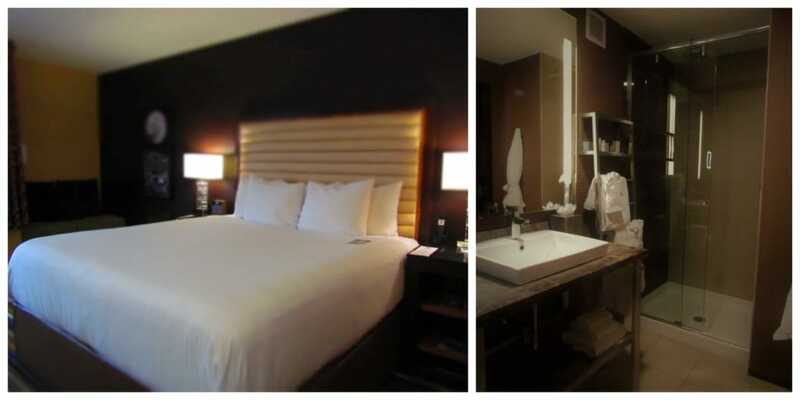 The bed was super comfy and the bathroom offered all the conveniences with a sleek, modern design. There were even some space decor touches in our room. We were fortunate enough to get a view of the Loop from our windows and could stake out our path of exploration for later. 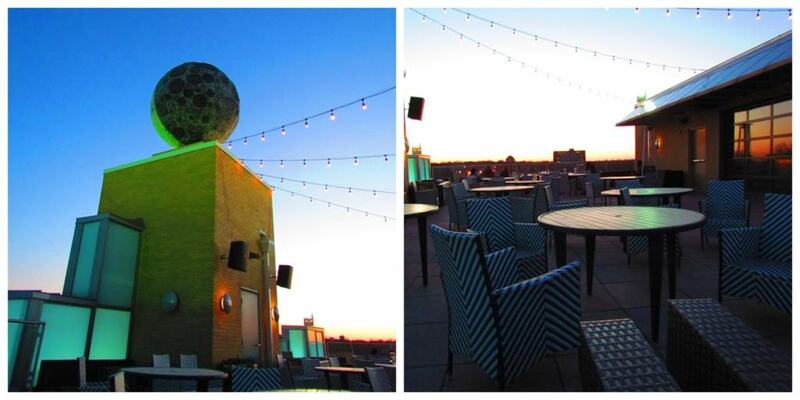 To get an even better view of the surrounding area, we made our way up to the St. Louis Rooftop Terrace Bar. This space is open from April through October. Stepping off of the elevator, we were deposited in the main bar area, which has a roof enclosure for inclement weather. Here is where you order your drinks, before heading out onto the roof for some one-on-one time with the outdoors. As we strolled around, we stopped to watch the iconic moon sculpture rotate. This was our first chance to see the dark side of the moon, even if it was just a model. The iridescent glow from the colored lighting sets a tone of casual intimacy, which is perfect for a romantic nightcap. 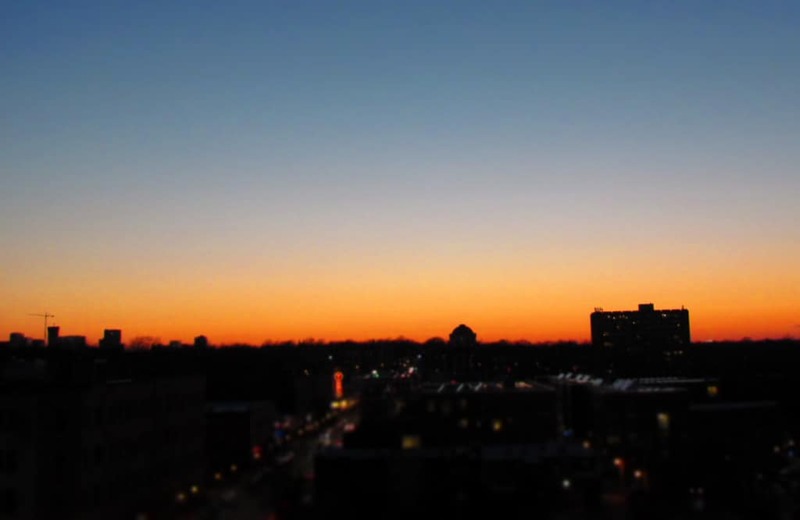 As the sun sank into the Midwestern landscape, we watched the sky turn to its familiar coloration. The sunsets in the Central U.S. are some of the most beautiful we have found. There are a few places that compete with them, but for consistent beauty we have found few to match. With darkness setting in, it was time to head off to explore and taste our way along the Loop. Dinner was calling and we knew dessert wouldn’t be far behind. Fortunately, we knew we had a comfortable space to come back to at the end of our day. 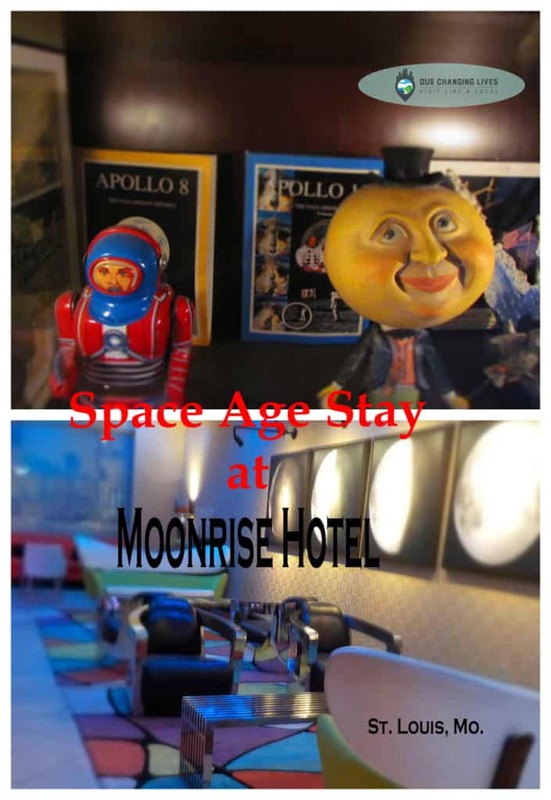 Have you ever stayed at the Moonrise Hotel? Tell us about your experience! Like the look of this place? Why not share it with friends! I bet our son would love to stay here. I love that staircase! It was such a fun stay. We hope you get to try it sometime. This has got to be one of the coolest hotels that I have seen. I would love to take my family to St. Louis! I hope you make it. The hotel is certainly a great conversation starter and the various space displays are amazing. So amazing and cool. Love the small toy and art pieces. We agree. It is so interesting to see the variety. What a cool theme guys! Fascinating. Makes for a genuine experience. Thanks for the rocking post. Thank you so much for the complimentary comment. We are so stoked that you enjoyed it.